Recently I have realized that one of the most important things in my life is quality sleep. Getting a good quality nights sleep can significantly impact my mood, productivity and general daily routine. I am much more likely to have a good day, if I have slept well the night before. You know the feeling, we have all been there, when you stayed out too late and in the morning you are beyond tired. Just keeping your eyes open is a strain and the day drags along at a snails pace. You are dreaming of how good it will feel to crawl back into bed and the day is far from productive. But also there is a build up of too little sleep every day. When you wake up and you feel tired and groggy every morning. You can’t drag yourself out of bed. You keep snoozing for another 30 minutes at least until you really have to get up or you’ll be late. 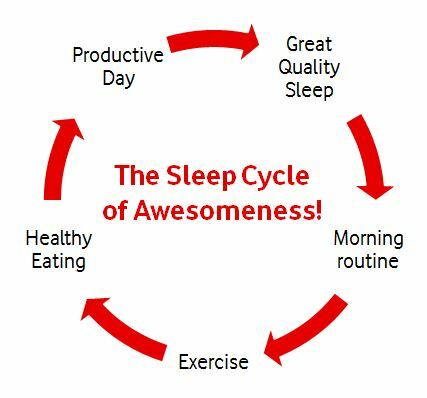 So whats the sleep cycle of awesomeness all about? This is the philosophy that getting a great quality sleep is linked to all other aspects of your daily routine and the lack of it can have significant negatives impacts. It’s the understanding that it is a cycle where everything is linked and if you nail getting great quality sleep, the rest of your routine will fall awesomely into place. Getting 7 – 8 hours good quality uninterrupted sleep is the starting point of the cycle. There are many ways to help you ensure a great sleep. You need to follow the suggested methods to help you sleep well. One of the most important suggestions to follow is forcing yourself to get up early however exhausted you are, for enough days until you start going to bed earlier. This will make you tired for this transition period, but following that it will get your body clock in the right time zone. Following a great sleep, you should wake up in the morning feeling refreshed and ready to jump out of bed. I’m a great believer in getting up to start the day, rather than just to go to work. This makes a big psychological difference to your day. It’s so much better when you wake up and you’re ready to get up, as you feel refreshed and rested, rather than having to snooze over and over again and drag yourself out of bed. If you can get up early you can have a productive morning routine where you have time to do things for yourself before having to start your working day. This can start your day off on a positive note and lead you to have an awesome day. If you have a great sleep, you are more likely to feel rested and therefore have the energy to exercise. If you can fit exercise into your morning routine it gives you the positive energy which really sets your day up well. Even if you don’t feel like it when you wake up. If you just do a quick 20 minutes, you will find it makes such a positive difference. If you have slept well and exercised, you are more likely to eat healthily. All these things are tied together. You will just feel healthier and therefore make better food choices. Sometimes if you are really tired, you lose your focus and this makes you more likely to make unhealthy choices. A healthy breakfast is great to incorporate into your morning routine and an awesome way to start your day. Once you have had a great night sleep, an effective morning routine including exercise and healthy eating, you are much more likely to have a productive day. You set off for work with a positive attitude and then when you arrive you are more alert, more focused and therefore can be much more productive. This is a big difference to coming in and counting down the hours before you have to leave again, as you are so tired. This is where the cycle concept comes in. If your day consists of all of the above steps, by the end of the day you will be physically and emotionally tired (in a good way) resulting in once again getting a better nights sleep. You can’t beat that feeling of being ‘good tired’ where you are looking forward to getting to bed and drifting off into a lovely deep sleep. So as you can see it’s all linked together. So if you can work on getting a decent nights sleep, the rest should follow more easily and in turn you will sleep better. I’d love to hear how important sleep is to you and how much it impacts your day if you don’t get enough.